The BBC World service reported yesterday (Sunday) that Israel had attacked a village in GAZA after a cease fire had been agreed. Once again the BBC is presenting a story totally out of context. Yes, there are discussions between Hamas and the Egyptians but let’s be clear there is no agreement for a cease fire with Israel. And let’s suppose there was such an agreement. Noam Bedein, the Director of the Regional News Service for Sderot & the Western Negev, writes “ How many people remember that there was, in fact, such a ‘ceasefire' with Hamas-controlled Gaza only one year ago? How many people remember what occurred during that 'ceasefire'? Well, the people in Sderot and the western Negev remember. Even if no one else does." During that 'ceasefire', Gazans launched 315 missiles targeted at Sderot and the western Negev, according to an IDF spokesman. There was not one IDF response to the rocket fire during that ceasefire period." Also in that 'ceasefire' period, on February 27, 2007, there was an agreement, the Mecca Agreement, reached between the Hamas leader Khaled Mashaal and Palestinian Authority Chairman Mahmoud Abbas (Abu Mazen). The agreement took place three months after the ceasefire went into effect; after 160 missiles had been fired at Israel since the day the 'ceasefire' commenced. Mashaal promised, in Moscow, to stop the Kassam rocket attacks. Two days later, seven missiles were launched from the Gaza Strip towards Israel. As reported by Calev Ben David http://www.jpost.com/servlet/Satellite?cid=1208870507031&pagename=JPost%2FJPArticle%2FShowFull in the Jerusalem Post today, in a recent article in the Los Angeles Times, Middle East expert Robert Satloff noted that Hamas "has no advocates of peace with Israel. The divide is between those who call for a tahdiya (a brief lull in the fighting) and those who favor a hudna (a longer-term armistice)." Speaking over the weekend to Al-Jazeera, Damascus-based Hamas chief Khaled Mashaal made it clear which side of that debate he is on. In discussing his organization's proposed cease-fire with Israel, he admitted, "It is a tactic in conducting the struggle... It is normal for any resistance that operates in its people's interest... to sometimes escalate; other times retreat a bit... The battle is to be run this way, and Hamas is known for that." It seems that even as a peanut farmer, Carter had to be bailed out with money from Saudi sources. Writes Dershowitz “Carter and his Center have accepted millions of dollars from suspect sources, beginning with the bail-out of the Carter family peanut business in the late 1970s by BCCI, a now-defunct and virulently anti-Israeli bank indirectly controlled by the Saudi Royal family, and among whose principal investors is Carter's friend, Sheikh Zayed. Agha Hasan Abedi, the founder of the bank, gave Carter "$500,000 to help the former president establish his center...[and] more than $10 million to Mr. Carter's different projects." Yes I could go on with this subject but let’s bury Carter’s visit finally. Carter is obviously not prepared to open his eyes to the true nature of Hamas. After leaving Gaza to be run by the Palestinians for the Palestinians, we have seen that the charter calling for the destruction of Israel is very much alive and well. 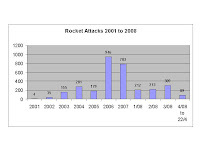 Rockets and other missiles are continuing to rain down on the civilian population. In addition snipers are now making life impossible for the farmers in Nahal Oz and Nir Oz. Farmers are now resorting to working at night in order to avoid being seen by the snipers. As was to be expected, Hamas having attempted to kill and maim as many soldiers and civilians as possible with their operations at the crossings points at Nahal Oz and Neve Shalom, which are used for transferring fuel and basic humanitarian aid, are now complaining through the United Nations relief organizations that the power plant will have to close down, sewage is not being collected and all the usual heart string pulling stories. And finally, now that Egypt has seen the necessity of building a wall (yes, this time it is a wall) along the southern border of Gaza, where is the outcry. Hamas is cynically using the general population whether they like it or not and then getting their proxies to cry “foul”. Just when will the world wake up to this nonsensical situation? Well, the visit of the inveterate octogenarian, former President Carter, has been and gone. He is and has been convinced that “if only Israel would be good little boys and talk to Hamas, then everything would be alright". Now which world is he living in? Another Associated Press writer ALBERT AJI, on the same day reporting from Damascus stated that Hamas leader Khaled Mashaal says “his militant Islamic group will not recognize Israel. However he says Hamas will accept a Palestinian state on Palestinian territories occupied by Israel in the 1967 Arab-Israeli war”. What a great base from which to destroy the State. And who is funding Carter and his peace making nonsense – but of course – the Arabs, who else! No ex President Carter, your presence here is a disgrace. Your term as President was replete with failures from Iran to Zimbabwe – go back to peanut farming. c) "In light of the weakness of the Arab nation and the lack of values, and in light of the American control over the world, the PLO proceeds through phases, without changing its strategy. Let me tell you, when the ideology of Israel collapses, and we take, at least, Jerusalem, the Israeli ideology will collapse in its entirety, and we will begin to progress with our own ideology, Allah willing, and drive them out of all of Palestine," - Abbas Zaki, the PLO ambassador in Beirut. Do we really understand the words that are used? And we closing our eyes and ears to what is going on around us? Are we not crazy to negotiate? We have “peace treaties” with Jordan and Egypt at governmental level but certainly not with the man in the street. The average Palestinian man in the street, according to opinion polls, doesn’t seem to accept any type of peace with Israel and is for the continuation of violence but then with constant incitement via the media and through official channels, should we expect anything else? Sky News is running a story “Unholy Row over Religious Site Dig” in a prominent place on its broadcasts which is in fact a new version on an old theme, and one that always ignores the important facts which are available to any competent reporter. Any dig undertaken by Israel is always viewed with suspicion whereas the untold damage to antiquities, when the Palestinians undertake “development work” at the Temple Mount, is conveniently ignored. The main digs are taking place in what used to be the Givati Parking lot, which is almost directly across from the Dung Gate in the Old City. The other main digging area is right next to the City of David visitor’s center. The parking lot definitely had no houses on it before the digging, (as claimed by the Sky News reporter) and I'm pretty sure the area next to the visitor’s center was empty as well. The digging is taking place tens or hundreds of meters underground, and is actually not digging out anything new, but they have discovered tunnels from Herod's time, and they are clearing them out. The tunnels were used by the pilgrims coming to the Temple on the three main holidays of Sukkot, Pessach and Shavuot). If the Arabs have qualms about these tunnels, they'll have to take it up with Herod. As for home and businesses being destroyed, that is total nonsense. I drive through Silwan on a daily basis, and nothing has changed. The roads are certainly not cracking, and the businesses are all open and receiving customers. The Name of the Game is "Green"
Green is the name of the game today and here in Israel from my perspective there is definitely an ever increasing awareness of the need to change our lifestyles in one way or another. The use of plastic bags when shopping is a no-no particularly in the supermarkets and we now bring a number of fabric bags on our shopping expeditions in order to avoid the use of the plastic bag. Why the manufacturers of such bags cannot produce in biodegradable plastics beats me but then I suppose, as always, it is down to a question of cost. I remember using biodegradable plastics for packaging a product I was involved in the manufacture of way back in the 1970’s – it seems it has not developed much since then. a) All light vehicles (up to 3.5 tons) imported into Israel comply with Euro 4 standards since January 2006 and all heavy vehicles (above 3.5 tons) comply with this standard since October 2006.
b) The sulfur content in 98 octane gasoline has been reduced to 10 ppm. and 10 ppm sulfur diesel fuel has been introduced into some 15 gas stations throughout the country. c) More stringent air pollution checks were introduced into the annual car registration tests for gas-powered vehicles, beginning with 1995 models, since March 2006. More stringent regulations on smoke emissions from diesel vehicles, which apply to the annual car registration test, beginning with 2001 models, came into force in June 2007. One component of the national plan is for the reduction of vehicular pollution relates to electric cars. This issue has been highly publicized in Israel and worldwide due to an initiative by Project Better Place to make electric cars available on the Israeli market. It is expected that the first electric cars to be available in Israel in 2011.
a) In Tel Aviv the number dropped to 45 days compared to 59 days. b) In Jerusalem 33 high air pollution days to 32 days. c) In Haifa 7 high air pollution days compared to 15 days. .
d) In Bet Shemesh 12 high air pollution days compared to 22 days. e) In Modi’in n22 high air pollution days compared to 18 days. Such efforts cannot be maintained without a full education program and at least 30 hours of study at every age level are to budgeted, including out of classroom activities. Further, instruction based on sustainable development guidelines is integrated with out of classroom activities and action in the environment. Highlighting of the environment as a central subject is now carried out in the framework of science and technology and geography studies in the 2007/8 school year. And finally, Initial training of some 100 leading teachers and assimilation of the subject on the regional level has been completed. Let’s hope this can help to guarantee to improve the world and its climate. A letter I received from a friend working at a hospital in the north expressess very succinctly the difference between the efforts to build a State in accordance with the Israeli model of honouring life, whilst the Palsestinians, who honour death are not doing anything to build a State in spite of the millions of dollars being donated. 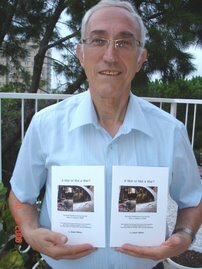 My friend writes "Israel is on a journey that began with a vision of Abraham, passed through the slave camps of Egypt, survived Nazi ovens and continues today in the land where it all began. The paradoxes of life in modern Israel are as abundant as the multi-colored poppies that blanket the Jezre’el Valley fields after late winter rains. Here in our Medical Center in Northeastern Israel, we are surrounded by both flowers and enemies. We hear daily reports of how Hezbollah and Syria (armed and nourished by Iran) are once again threatening our lives and way of life, while we continue to heal those who step through our doors. “Israel seeks peace while preparing for war” is a slogan often heard. Our center does not seek peace – we live it. After the long range missile bombardment of 2006, we are busy fortifying the facilities. Not as an act of war, but as an act of self preservation and humanity. While some of our neighbors are busy seeking ways to kill Jews, we are busy investing huge sums so that we may be somewhat protected while we heal others. Despite the tangible threats vilifying the Middle Eastern atmosphere, Israel and ouir medical center thrive among the flowers. Every hour you may witness a Jew saving an Arab and vice versa, or wonder at the research being performed that will benefit all mankind, or listen to the sounds of construction while distant voices scream destruction. What is the center's answer to violence and the senseless premeditated taking of lives? 4,500 births each year and the planning of new Labor, Deliver & Recovery Suites that will serve all our region’s women. While Islamic fanatics glorify death, we, in particular, and Israel, in general, sanctify life. What greater respect could we show to our Creator than by striving to heal all children and their families? Our Medical Center is a creation of Israel and a luminous, vibrant house of healing that exemplifies the best of humanity. We have a long way to go as we accompany our people along this arduous path. The road ahead is fraught with danger … and strewn with flowers." In a report from London this week comes the news that Israel and Iran receive lowest ratings in the UK in a BBC poll, this for the second year running. What a surprise!! With the attitudes of the media in the UK, is it any wonder. Published on Wednesday, the BBC World Service poll asked people to rate Brazil, Britain, China, France, Germany, India, Iran, Israel, Japan, North Korea, Pakistan, Russia, the US and the European Union as having a mainly positive or negative influence in the world. Negative views of Israel fell over the past year from 57 percent, to 52%, while negative views of Iran's influence held steady at 54%, giving it the worst rating of the countries tested. Pakistan followed Israel with the third worst rating. As one commentator on Israeli affairs, Lorna Fitzsimmons of BICOM in London pointed out "This BBC poll shows that viewers don't really understand the core issues within the Middle East conflict, even after watching BBC coverage. Israel has a big challenge. People have such a limited time to digest news - never mind foreign news - that they build up perceptions based on a snapshot. When Israel is only referred to in terms of conflict, this only exacerbates the problem." The constant biased reporting of the BBC and a number of influential daily newspapers constantly builds up an unbalanced image and a society that does not have access to the real Israel, only the artificial image projected by the media.